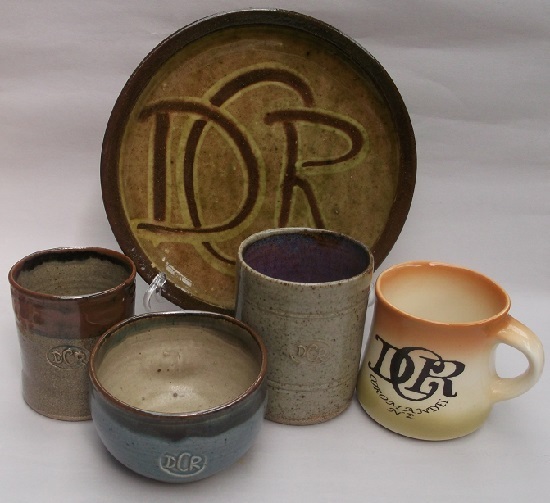 No idea who made this DCR slipcast mug, but it's well made and hopefully we can find out one day. 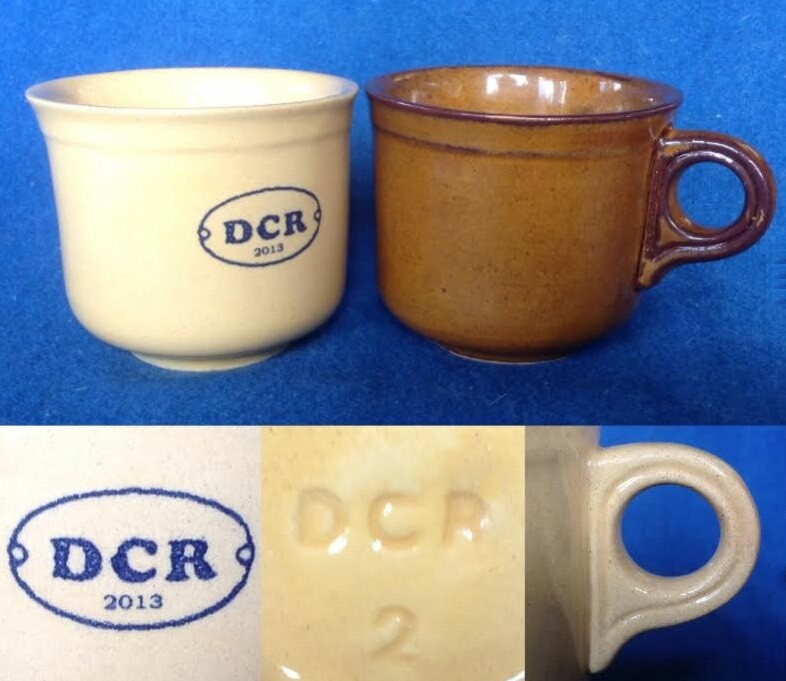 A pair of Driving Creek Railway DCR cups dated 2013. I guess the missing photo above showed something like these. I thought at first that these were jiggered cups but after reading Ev's description above I had another look. There are no fettling marks but the inside bottom is a bit wibbly. The handle on the darker one looks like it's applied later but the paler one looks cast in situ. These are made in a traditional railway cup shape which closely follows that of the Crown Lynn 700 cups (above left). Size is pretty much the same too. Handle slightly different, footring deeper, and cup body has a rim. These two examples approximate the look of Crown Lynn Pioneer glaze and Ambrico straw-coloured pottery. I should keep an eye out for saucers to match. As this is my first sighting of such things I don't know if saucers exist but they are a cup shape rather than mug so I see it as a possibility. 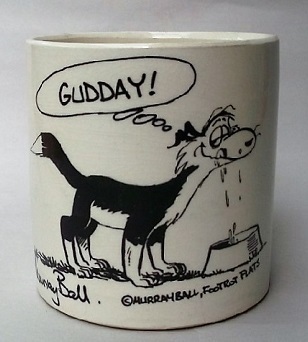 Re: Another Driving Creek Railway mug. The one on the right of these DCR pieces is the one that was in the first post ..
Oh goody, I found something new! Maybe my ones are jiggered then. I'll get some other opinions on Thursday when the gang comes around. Would these mass-produced pieces have been for use in the cafe then? I'm not sure about the Café idea, as I wasn't aware there was one. However the pottery shop has been going for a very long time and I would consider them souvenirs. Remember the first DCR pots were for funding the railway. I thought everywhere had a cafe these days! My last memory of Driving Creek is Barry taking us up to the top on the train. Beyond that I have nothing. Dad knew Barry from the train community. I'm not even sure that it was even open to the public at the time, or on the day, we were there as it was definitely only us on the train. Maybe someone else was driving another train but I forget. It's a while back now.